The Most Incredible Mass Sighting Of All? Including Stunning New Photo Analysis! Five years before Roswell, five years before pilot Kenneth Arnold's landmark sightings of "flying saucers" in the Pacific Northwest, 3 years before the Battle of the Bulge, two years before D-Day, and years before the so-called "modern UFO era" had officially begun, there was the Battle of Los Angeles, arguably the most sensational, dramatic UFO mass encounter on record. Have you ever heard of the Battle of Los Angeles? Few have. Imagine a visiting spacecraft from another world, or dimension, hovering over a panicked and blacked-out LA in the middle of the night just weeks after Pearl Harbor at the height of WWII fear and paranoia. Imagine how this huge ship, assumed to be some unknown Japanese aircraft, was then attacked as it hung, nearly stationary, over Culver City and Santa Monica by dozens of Army anti-aircraft batteries firing nearly 2,000 rounds of 12 pound, high explosive shells in full view of hundreds of thousands of residents. Imagine all of that and you have an idea of what was the Battle of Los Angeles. 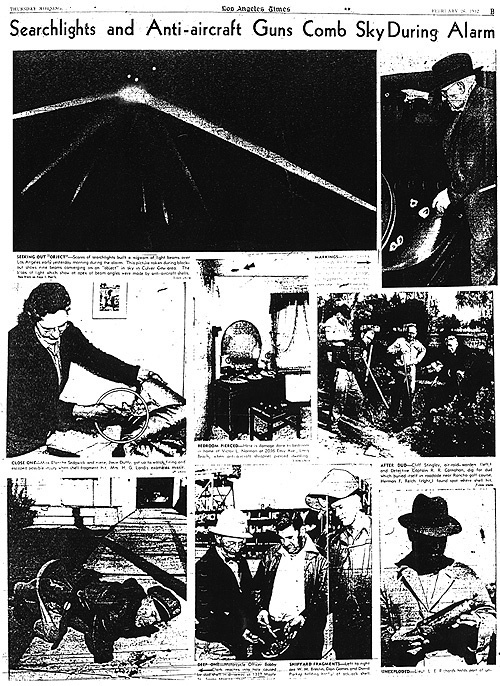 The sudden appearance of the enormous round object triggered all of LA and most of Southern California into an immediate wartime blackout with thousands of Air Raid Wardens scurrying all over the darkened city while the drama unfolded in the skies above... a drama which would result in the deaths of six people and the raining of shell fragments on homes, streets, and buildings for miles around. shows the huge craft caught in the converging spotlights! Pay close attention to the convergence of the searchlights and you will clearly see the shape of the visitor within the illuminated target area. It's a BIG item and seemed completely oblivious to the hundreds of AA shells bursting on and adjacent to it which caused it no evident dismay. There were casualties, however...on the ground. At least 6 people died as a direct result of the Army's attack on the UFO which slowly and leisurely made its way down to and then over Long Beach before finally moving off and disappearing. In February, 1942, Katie was a young, beautiful, and highly-successful interior decorator and artist who worked with many of Hollywood's most glamorous celebrities and film industry luminaries. She lived on the west side of Los Angeles, not far from Santa Monica. With the outbreak of the war with Japan and the rising fear of a Japanese air attack, or even invasion of the West Coast, thousands of residents volunteered for wartime duties on the home front. Katie volunteered to become an Air Raid Warden as did 12,000 other residents in the sprawling city of Los Angeles and surrounding communities. In the early morning hours of February 25th, Katie's phone rang. It was the Air Raid supervisor in her district notifying her of an alert and asking if she had seen the object in the sky very close to her home. She immediately walked to a window and looked up. "It was huge! It was just enormous! And it was practically right over my house. I had never seen anything like it in my life!" she said. "It was just hovering there in the sky and hardly moving at all." With the city blacked out, Katie, and hundreds of thousands of others, were able to see the eerie visitor with spectacular clarity. "It was a lovely pale orange and about the most beautiful thing you've ever seen. I could see it perfectly because it was very close. It was big!" The U.S. Army anti-aircraft searchlights by this time had the object completely covered. "They sent fighter planes up (the Army denied any of its fighters were in action) and I watched them in groups approach it and then turn away. There were shooting at it but it didn't seem to matter." Katie is insistent about the use of planes in the attack on the object. The planes were apparently called off after several minutes and then the ground cannon opened up. "It was like the Fourth of July but much louder. They were firing like crazy but they couldn't touch it." The attack on the object lasted over half an hour before the visitor eventually disappeared from sight. Many eyewitnesses talked of numerous "direct hits" on the big craft but no damage was seen done to it. "I'll never forget what a magnificent sight it was. Just marvelous. And what a georgeous color! ", said Katie. "The object...caught in the center of the lights like the hub of a bicycle wheel surrounded by gleaming spokes. The fire seemed to burst in rings all around the object." Explosions stabbing the darkness like tiny bursting stars... Searchlight beams poking long crisscross fingers across the night sky...Yells of wardens and the whistles of police and deputy sheriffs...The brief on-and-off flick of lights, telephone calls, snatches of conversation: 'Get the dirty...' That was Los Angeles under the rumble of gunfire yesterday. Sleepy householders awoke to the dull thud of explosions... "Thunder? Can't be!" Then: "Air Raid! Come here quick! Look over there...those searchlights. They've got something...they are blasting in with anti-aircraft!" Father, mother, children all gathered on the front porch, congregated in small clusters in the blacked out streets -- against orders. Babies cried, dogs barked, doors slammed. But the object in the sky slowly moved on, caught in the center of the lights like the hub of a bicycle wheel surrounded by gleaming spokes. Speculation fell like rain. "It's a whole squadron." "No, it's a blimp. It must be because it's moving so slowly." "I hear planes." "No you don't. That's a truck up the street." "Where are the planes then?" "Dunno. They must be up there though." "Wonder why they picked such a clear night for a raid?" "They're probably from a carrier." "Naw, I'll bet they are from a secret air base down south somewhere." Still the firing continued. Like lethal firecrackers, the anti-aircraft rounds blasted above, below, seemingly right on the target fixed in the tenacious beams. Other shots fell short, exploding halfway up the long climb. Tracers sparked upward like roman candles. Metal fell. It fell in chunks, large and small; not enemy metal, but the whistling fragments of bursting ack-ack shells. The menacing thud and clank on streets and roof tops drove many spectators to shelter. Wardens were on the job, doing a good job of it. "Turn off your lights, please. Pull over to the curb and stop. Don't use your telephone. Take shelter. Take shelter." On every street brief glares of hooded flashlights cut the darkness, warning creeping drivers to stop. Police watched at main intersections. Sirens wailed enroute to and from blackout accidents. There came lulls in the firing. The search lights went out. (To allow the fighter planes to attack?). Angelinos breathed deeply and said, "I guess it's all over." But before they could tell their neighbors good night, the guns were blasting again, sighting up the long blue beams of the lights. The fire seemed to burst in rings all around the target. But the eager watchers, shivering in the early morning cold, weren't rewarded by the sight of a falling plane. Nor were there any bombs dropped. "Maybe it's just a test," someone remarked. "Test, hell!" was the answer. "You don't throw that much metal in the air unless you're fixing on knocking something down." Still the firing continued, muttering angrily off toward the west like a distant thunderstorm. The targeted object inched along high, flanked by the cherry red explosions. And the householders shivered in their robes, their faces set, watching the awesome scene. 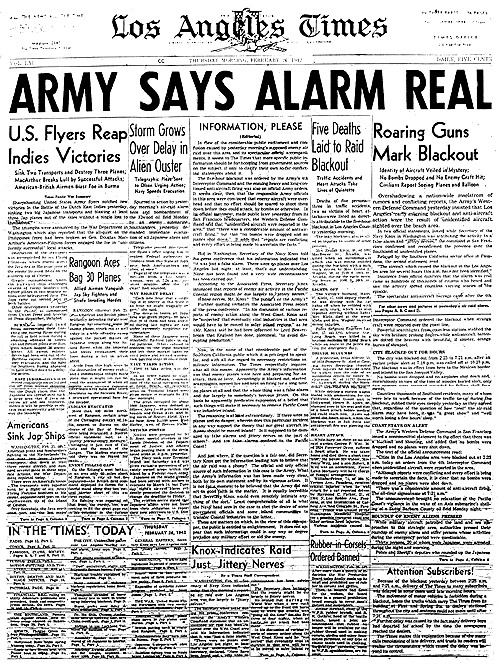 Overshadowing a nation-wide maelstrom of rumors and conflicting reports, the Army's Western Defense Command insisted that Los Angeles' early morning blackout and anti-aircraft action were the result of unidentified aircraft sighted over the beach area. In two official statements, issued while Secretary of the Navy Knox in Washington was attributing the activity to a false alarm and "jittery nerves," the command in San Francisco confirmed and reconfirmed the presence over the Southland of unidentified planes. Relayed by the Southern California sector office in Pasadena, the second statement read: "The aircraft which caused the blackout in the Los Angeles area for several hours this a.m. have not been identified." Insistence from official quarters that the alarm was real came as hundreds of thousands of citizens who heard and saw the activity spread countless varying stories of the episode. The spectacular anti-aircraft barrage came after the 14th Interceptor Command ordered the blackout when strange craft were reported over the coastline. Powerful searchlights from countless stations stabbed the sky with brilliant probing fingers while anti-aircraft batteries dotted the heavens with beautiful, if sinister, orange bursts of shrapnel. The city was blacked out from 2:25 to 7:21 am after an earlier yellow alert at 7:18 pm was called off at 10:23 pm. The blackout was in effect from here to the Mexican border and inland to the San Joaquin Valley. No bombs were dropped and no airplanes shot down and, miraculously in terms of the tons of missiles hurled aloft, only two persons were reported wounded by falling shell fragments. Countless thousands of Southland residents, many of whom were late to work because of the traffic tie-up during the blackout, rubbed their eyes sleepily yesterday and agreed that regardless of the question of how "real" the air raid alarm may have been, it was "a great show" and "well worth losing a few hours' sleep." The blackout was not without its casualties, however. A State Guardsman died of a heart attack while driving an ammunition truck, heart failure also accounted for the death of an air raid warden on duty, a woman was killed in a car-truck collision in Arcadia, and a Long Beach policeman was killed in a traffic crash enroute to duty. Much of the firing appeared to come from the vicinity of aircraft plants along the coastal area of Santa Monica, Inglewood, Southwest Los Angeles, and Long Beach. In its front page editorial, the Times said: "In view of the considerable public excitement and confusion caused by yesterday morning's supposed enemy air raid over this area and its spectacular official accompaniments, it seems to The Times that more specific public information should be forthcoming from government sources on the subject, if only to clarify their own conflicting statements about it." "According to the Associated Press, Secretary Knox intimated that reports of enemy air activity in the Pacific Coastal Region might be due largely to 'jittery nerves.' Whose nerves, Mr. Knox? The public's or the Army's?" The following is an excerpt of an article appearing in Fate Magazine. Our special thanks to Bill Oliver of UFO*BC for transcribing and bringing it to our attention. On Wednesday, February 25, 1942, as war raged in Europe and Asia, at least a million Southern Californians awoke to the scream of air-raid sirens as Los Angeles County cities blacked out at 2:25 AM. Many dozed off again while 12,000 air raid wardens reported faithfully to their posts, most of them expecting nothing more than a dress rehearsal for a possible future event - an invasion of the United States by Japan. At 3:36, however, they were shocked and their slumbering families rudely roused again, this time by sounds unfamiliar to most Americans outside the military services. The roar of the 37th Coast Artillery Brigade's antiaircraft batteries jolted them out of bed and before they could get to the windows the flashing 12.8 pound shells were detonating with a heavy, ominous boomp - boomp - boomp and the steel was already raining down. All radio stations had been ordered off the air at 3:08. But the news was being written with fingers of light three miles high on a clear star-studded blackboard 30 miles long. The firing continued intermittently until 4:14. Unexploded shells destroyed pavement, homes and public buildings, three persons were killed and three died of heart attacks directly attributable to the one hour barrage. Several persons were injured by shrapnel. A dairy herd was hit but only a few cows were casualties. The blackout was lifted and sirens screamed all clear at 7:21. The shooting stopped but the shouting had hardly begun. Military men who never flinched at the roar of rifles now shook at the prospect of facing the press. While they probably could not be blamed for what had happened, they did have some reason for distress. The thing they had been shooting at could not be identified. Caught by the searchlights and captured in photographs, was an object big enough to dwarf an apartment house. Experienced lighter-than-air (dirigible) specialists doubted it could be a Japanese blimp because the Japanese had no known source of helium, and hydrogen was much too dangerous to use under combat conditions. Whatever it was, it was a sitting duck for the guns of the 37th. Photographs showed shells bursting all around it. A Los Angeles Herald Express staffer said he was sure many shells hit it directly. He was amazed it had not been shot down. The object that triggered the air raid alarm had drawn 1430 rounds of ammunition from the coast artillery, to no effect. When it moved at all, the object had proceeded at a leisurely pace over the coastal cities between Santa Monica and Long Beach, taking about 30 minutes of actual flight time to move 20 miles; then it disappeared from view. You can well imagine with what chagrin public information officers answered press queries. The Pasadena Office of the Southern California Sector of the Army Western Defense Command simply announced that no enemy aircraft had been identified; no craft was shot down; no bombs were dropped; none of our interceptors left the ground to pursue the intruder. Soon thereafter US Navy Secretary Frank Knox announced that no planes had been sighted. The coastal firing had been triggered, he said, by a false alarm and jittery nerves. He also suggested that some war industries along the coast might have to be moved inland to points invulnerable to attacks from enemy submarines and carrier-based planes. The press responded with scathing editorials, many on page one, calling attention to the loss of life and denouncing the use of the coast artillery to fire at phantoms. The Los Angeles Times demanded a full explanation from Washington. The Long Beach Telegram complained that government officials who all along had wanted to move the industries were manipulating the affair for propaganda purposes. And the Long Beach Independent charged: "There is a mysterious reticence about the whole affair and it appears some form of censorship is trying to halt discussion of the matter. Although it was red-hot news not one national radio commentator gave it more than passing mention. This is the kind of reticence that is making the American people gravely suspect the motives and the competence of those whom they have charged with the conduct of the war." The Independent had good reason to question the competence of some of the personnel responsible for our coastal defense operations as well as the integrity and motives of our highest government officials. Only 36 hours before the Long Beach air raid, a gigantic Japanese submarine had surfaced close to shore 12 miles north of Santa Barbara and in 25 minutes of unchallenged firing lobbed 25 five-inch shells at the petroleum refinery in the Ellwood oil field. The Fourth Interceptor Command, although aware of the sub's attack, ordered a blackout from Ventura to Goleta but sent no planes out to sink it. Not one shot was fired at the sub. After the Ellwood incident had alerted all the West Coast defense posts to possible repeat attacks, these units were sensitive to anticipated invasion attempts. By Wednesday morning in the Los Angeles area they were ready to open fire on a boy's kite if it in any way resembled a plane or a balloon. Secretary of War Henry Stimson praised the 37th Cost Artillery for this attitude. It is better to be a little too alert than not alert enough, he said. At the same time he delicately suggested that it might have been a good idea to send some of our planes up to identify the invading aircraft before shooting at them. Planes of the Fourth Interceptor Command were, in fact, warming up on the runways waiting for orders to go up and interview the unknown intruders. Why, everybody was asking, were they not ordered to go into action during the 51-minute period between the first air-raid alert at 2:25 AM and the first artillery firing at 3:16? Against this background of embarrassing indecision and confusion, Army Western Defense Command obviously had to say something fast. Spokesmen told reporters that from one to 50 planes had been sighted, thus giving themselves ample latitude in which to adjust future stories to fit whatever propaganda requirements might arise in the next few days. When eyewitness reports from thousands searching the skies with binoculars under the bright lights of the coast artillery verified the presence of one enormous, unidentifiable, indestructible object - but not the presence of large numbers of planes - the press releases were gradually scaled downward. A week later Gen. Mark Clark acknowledged that army listening posts had detected what they thought were five light planes approaching the coast on the night of the air raid. No interceptors, he said, had been sent out to engage them because there had been no mass attack. Believing an aerial bombardment was in progress, some people thought they saw formations of warplanes, dogfights between enemy craft and our fighter planes and other things that they assumed were evidence of such an attack. Obviously there were no dogfights because none of our interceptors were in the air. Tracer bullets were fired from military ground stations and some people mistook the fire pattern made by these projectiles for aerial combat. 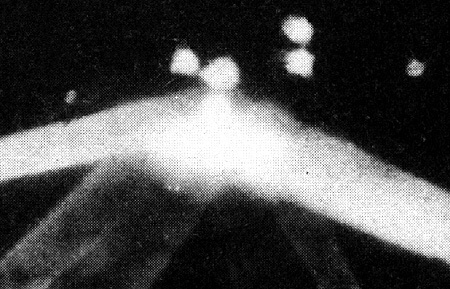 Other observers reported lighted objects which were variously described as red-and-white flares in groups of three red and three white, fired alternately, or chainlike strings of red lights looking something like an illuminated kite. 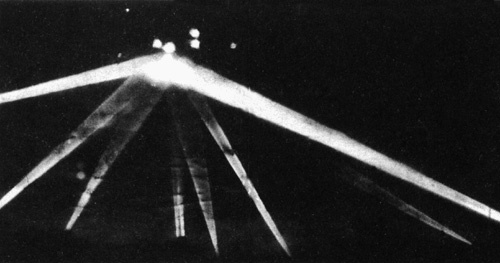 People suggested that some of these lights were caused by Japanese-Americans signaling approaching Japanese aircraft with flares to guide them to selected targets, but because no bombs were dropped, the theory was quickly abandoned. In any case, such charges fitted in perfectly with a hysterical press campaign to round up all citizens of Japanese descent and put them in concentration camps. During the week of the Japanese submarine attack on the Ellwood oil field and the air raid on Los Angeles County, the press took full advantage of the made-to-order situation. Arrests of suspects were quickly made and the FBI was called in, but the Long Beach Press Telegram stated all investigations indicated nobody was signaling the enemy from the ground. "From Santa Barbara, area of the submarine attack Monday night, District Attorney Percy Heckendorf said he would appeal to Lt. Gen. John L. DeWitt, commanding officer of the Western Defense Command, to make Santa Barbara County a restricted area for enemy nationals and American-born Japanese as well. "There is convincing proof," Heckendorf asserted, "that there were shore signals flashed to the enemy." Heckendorf said the people will hold Gen. DeWitt responsible if he failed to act. Army ordinance officers, meanwhile, were studying more than 200 pounds of shell fragments from missiles fired by the submarine, which caused only $500 damage in the Ellwood oil field near Santa Barbara." It is said by some locals that the skipper or one of the officers on the Japanese sub had worked in the Ellwood oil field some years prior to the outbreak of the war. The story claims that the man had been mistreated by some of his co-workers during that time, had returned to Japan before the war began, and had then subsequently helped lead the submarine back to the area to make it's attack. On Wednesday, February 25, 1942, at precisely 2 a.m., diners at the trendy Trocadero club in Hollywood were startled when the lights winked out and air raid sirens began to sound throughout greater Los Angeles. "Searchlights scanned the skies and anti-aircraft guns protecting the vital aircraft and ship-building factories went into action. In the next few hours they would fire over 1,400 shells at an unidentified, slow- moving object in the sky over Los Angeles that looked like a blimp, or a balloon." Author Ralph Blum, who was a nine-year-old boy at the time, wrote that he thought "the Japanese were bombing Beverly Hills." "There were sirens, searchlights, even antiaircraft guns blamming away into the skies over Los Angeles. My father had been a balloon observation man (in the AEF) in World War One, and he knew big guns when he heard them. He ordered my mother to take my baby sisters to the underground projection room--our house was heavily supplied with Hollywood paraphernalia--while he and I went out onto the upstairs balcony." "What a scene! It was after three in the morning. Searchlights probed the western sky. Tracers streamed upward. The racket was terrific." Shooting at the aerial intruders were gunners of the 65th Coast Artillery (Anti-Aircraft) Regiment in Inglewood and the 205th Anti-Aircraft Regiment based in Santa Monica. The "white cigar-shaped object" took several direct hits but continued on its eastward flight. 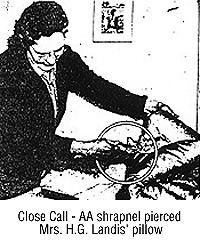 Up to 25 silvery UFOs were also seen by observers on the ground. Editor Peter Jenkins of the Los Angeles Herald Examiner reported, "I could clearly see the V formation of about 25 silvery planes overhead moving slowly across the sky toward Long Beach." 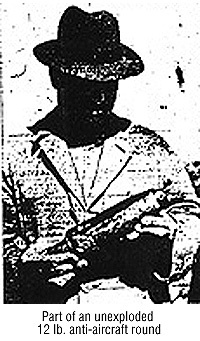 Long Beach Police Chief J.H. McClelland said, "I watched what was described as the second wave of planes from atop the seven-story Long Beach City Hall. I did not see any planes but the younger men with me said they could. An experienced Navy observer with powerful Carl Zeiss binoculars said he counted nine planes in the cone of the searchlight. He said they were silver in color. The (UFO) group passed along from one battery of searchlights to another, and under fire from the anti-aircraft guns, flew from the direction of Redondo Beach and Inglewood on the land side of Fort MacArthur, and continued toward Santa Ana and Huntington Beach. Anti-aircraft fire was so heavy we could not hear the motors of the planes." Reporter Bill Henry of the Los Angeles Times wrote, "I was far enough away to see an object without being able to identify it...I would be willing to bet what shekels I have that there were a number of direct hits scored on the object." "At least a million residents awoke to air raid sirens at 2:25am., and U.S. Army personnel fired 1,430 rounds of antiaircraft shells to bring down what they assumed were Japanese planes. But these were not Japanese planes. George Marshall wrote a memorandum to President Roosevelt about the incident, which remained classified until 1974. Marshall concluded that conventional aircraft were involved, probably "commercial sources, operated by enemy agents for purposes of spreading alarm, disclosing location of antiaircraft positions, and slowing production through blackout." Despite the barrage of American antiaircraft fire, none of these "commercial" planes were brought down, although several homes and buildings were destroyed, and six civilian deaths were attributed to the barrage. Considering the carnage, the military's explanation was meager. U.S. Navy Secretary Knox even denied that any aircraft had been over the city; he called the incident a false alarm due to war nerves. The local press, needless to say, did not take this very well. The Long Beach Independent noted that: "There is a mysterious reticence about the whole affair and it appears some form of censorship is trying to halt discussion of the matter." It is noteworthy that for thirty years until the release of the Marshall memorandum, the Department of Defense claimed to have no record of the event. Five years before Roswell, them military was already learning to clamp down on UFOs."